The four surplus class 460 driving motor brake luggage first open vehicles are currently lined up outside Doncaster Works, all pretty well stripped and mounted on B4 accommodation bogies. The tarpaulin covers a hold in the roof where there was a hatch, which has presumably been removed for spares, just like almost everything else that could be used on Class 458/5. However, note they still retain their "Vader" fronts! 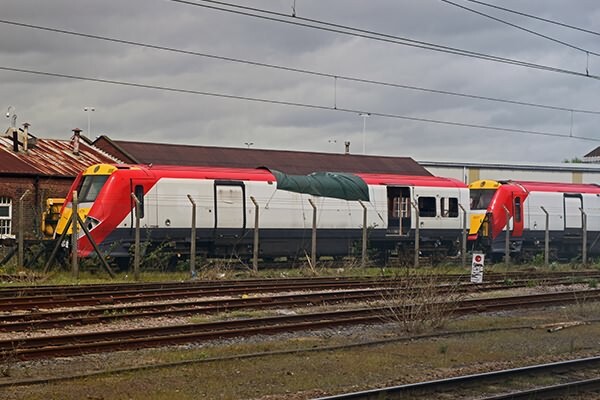 The picture, taken from a passing train, shows 67901 (ex 460001) and 67907 (ex 460007) on 6th May 2015.